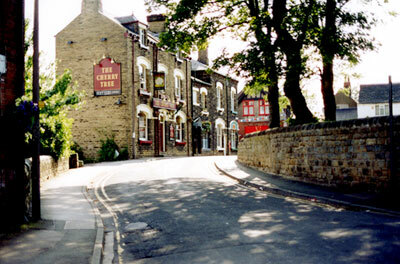 Horbury is a village southwest of Wakefield. 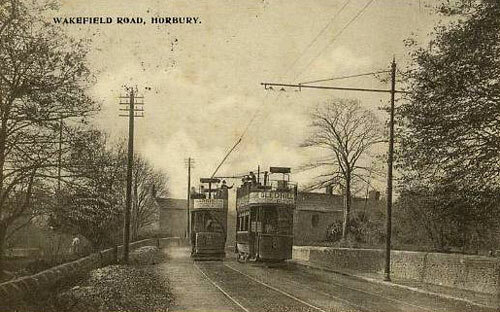 Horbury was in the "parish" of Wakefield. 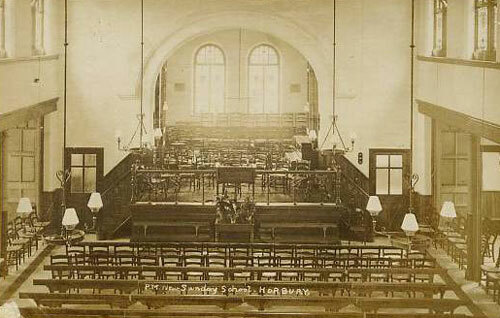 However, the records for Horbury were kept separately. 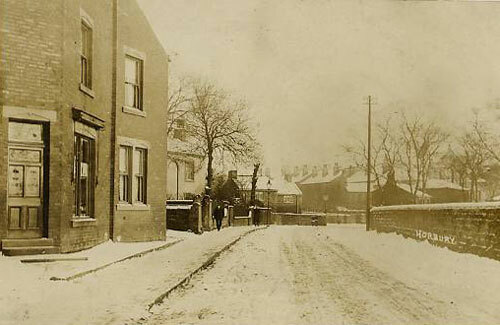 In February 2006 Lesley Curtis very generously shared ten lovely old images of Horbury. 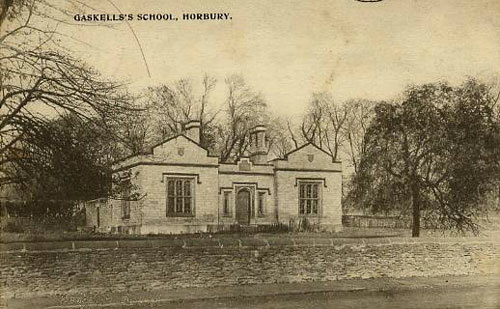 William Mortimer was listed as the master of the Gaskell's Endowed School in the 1887 Trade Directory for Horbury. 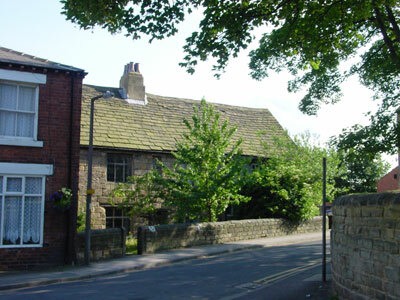 William Mortimer the master of the Gaskell's Endowed School was born circa 1823 in either Leeds or Cleckheaton - the census records list both in different years. 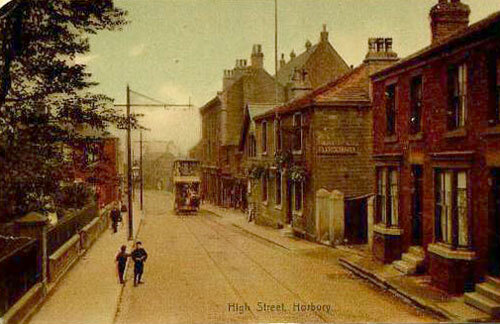 He was first listed as a school master in Hobury in the 1851 Census. He was listed as such in the 1861, 1871 and 1881 censuses. 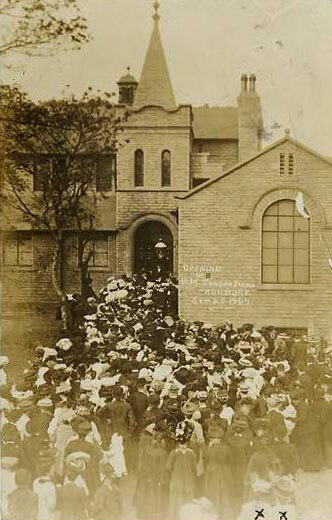 His wife's name was Mary and he had three daughters, who helped him in the school. 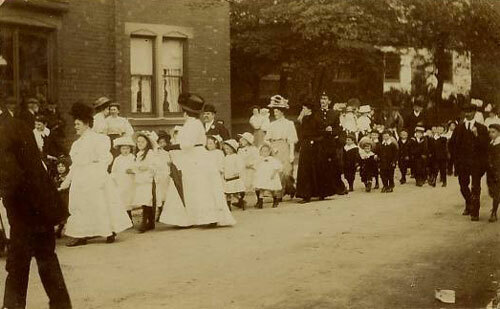 The 1871 census lists William Mortimer head age 49, infant schoolmaster, born Cleckheaton, Mary wife, age 45, born Nether Shitlington, Emmeline daughter age 23 music teacher, Annie age 16 infant teacher, Mary age 6, all born Horbury. The 1881 census lists William Mortimer, age 58 schoolmaster and his wife, Mary, age 55 and two daughters Annie (no occupation) and Mary assistant teacher. 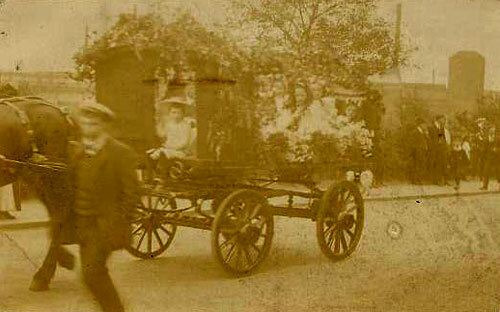 William was listed in the 1891 census as a retired school teacher and his wife had died by then. He was still listed in the 1901 census - retired school teacher. 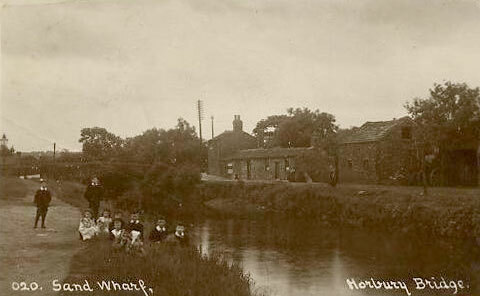 Some of the earliest records for the name Land were in Horbury. 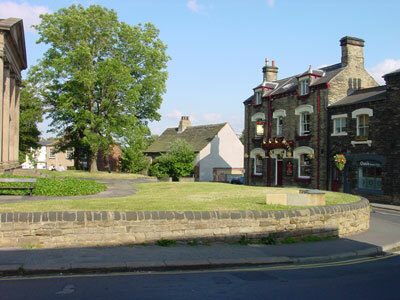 It is possible that the Lands living in Wakefield in the mid 1700s were originally from Horbury. I have not, however, been able to make a definite connection. 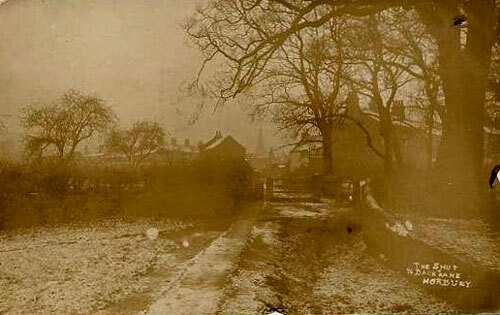 On one side the church of St Peter and St Leonard, build in 1791, there were several cute old houses. This house is next to the "Cherry Tree" in the photo above. Doorway of the house pictured above. 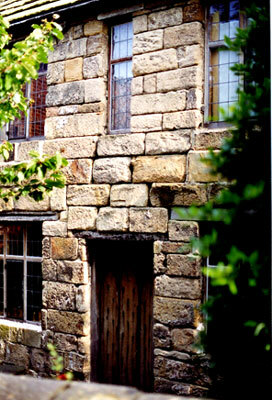 Note that the ground level of the house is below the ground level of today. 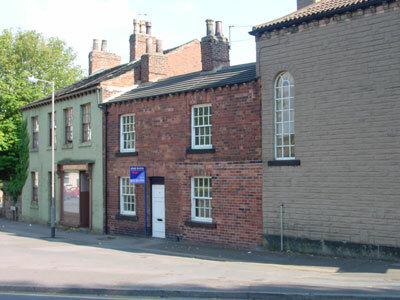 On the same street to the east were these three buildings. 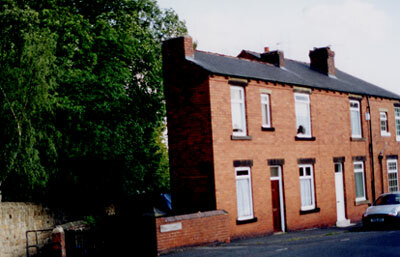 These houses were on a side street behind the houses pictured above. The house on the left is so lacking in depth it must be like living in a hallway. 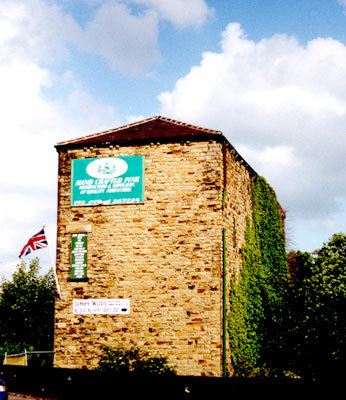 Just across the Calder River going from Horbury towards Huddersfield stands this old mill. 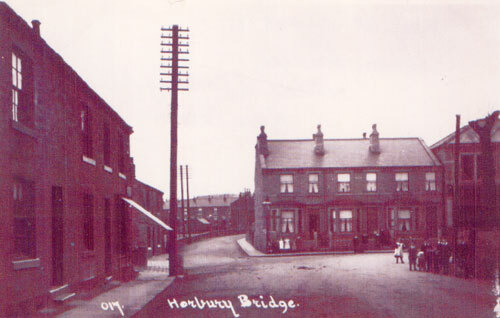 In March 2015 Bob Shipley wrote that the mill is actually "just across the railway going from Horbury".